Were you at a show featuring C.J. 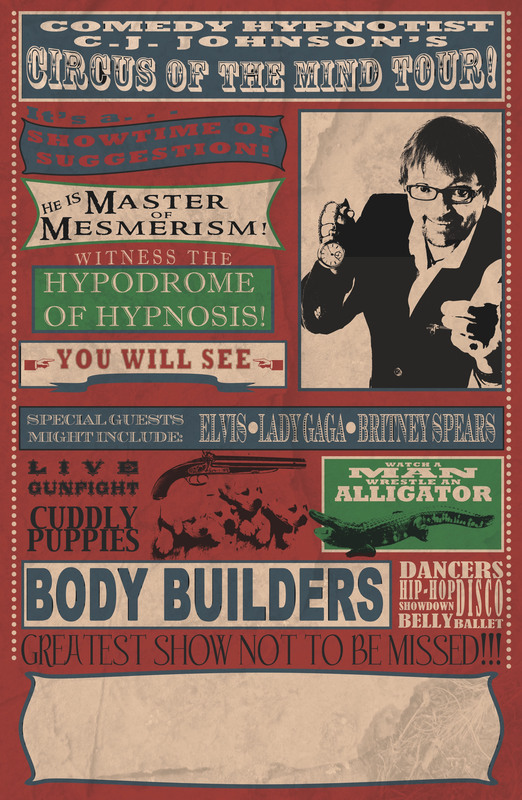 's Comedy Hypnosis Show? If so, chances are good that he shot video of it. Choose the year, then browse the drop down menu in the shopping cart to see what's available. DVD's are $25.00 plus postage. Not all shows are available. Allow 7-21 days, depending on tour schedule, for delivery via USPS. 2016 & 2017 DVD's have not been updated. Contact us to see if yours is available. This shirt's "Open Mind" design is full of memories from those who watched the show or were in it. Each item coming out of the open mind (which spells out "SleepWithCJ") represents a routine from the show. It's a cool looking shirt to wear, not just a cool souvenir. Printed on Natural Cotton Shirts. Select size during checkout process. You can watch the contents of this DVD here on the website via streaming video. If you're a collector, fellow hypnotist or someone else who likes to keep an archive of this sort of thing, this allows you an ethical way (not pretending to be a client) to get one. An early promo picture of C.J. and one of our favorites. It really makes his big blue eyes pop out! Another early promo picture of C.J. What made this picture interesting is the process of making it. All of the effects were done in camera by Dallas Photographer David Thomason. Offset printed on 8.5x11 Glossy Cardstock. 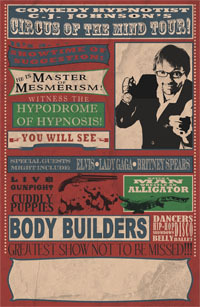 This is the current poster for C.J. 's tour "Circus of the Mind". Original artwork by Jonny Zavant. Printed on 11x17 glossy paper. Shipped in a mailing tube without creases. and all I got was this lousy button!"